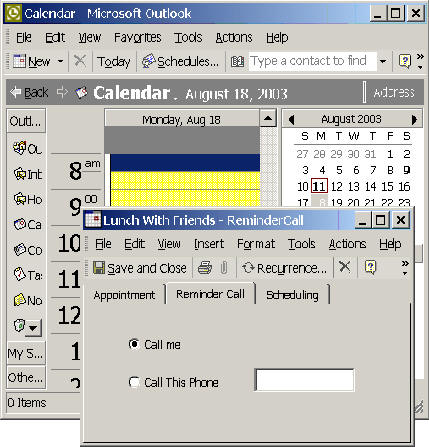 Automatic appointment reminder by phone from Microsoft Outlook. A FREE Outlook addin that takes advantage the telephony capabilities of Voicent Gateway, a VoiceXML gateway software from Voicent Communications, Inc. Free version available. The alert pop up window from Outlook is useless if you are not in front of your computer. This program solves the problem by enabling Outlook to call your cell phone or any phone for the appointment alert. The appointment reminder message, containing subject, location, start time, and notes, is read by computer over the phone using text to speech technology. Easy to use and fully integrated with Microsoft Outlook. Since it is an addin, the program automatically starts when Outlook starts, and terminates when Outlook terminates. OutlookReminder adds a Reminder Call page to Outlook's new appointment dialog. In that page you can specify whether to make appointment reminder call and the number to call. At the appointment reminder time, the usual alert window will pop up and an alert phone call will be made automatically. The default is no reminder call, so everything is exactly the same if you do not set up the appointment reminders. You can set up Voicent Gateway in another machine and have this program connects to it over the network. This is made possible by Voicent Gateway's web capability. It is easy to share a common gateway by different people or at different locations, such as one at home and the other at office. Appointment reminders by phone is also possible by using Voicent AutoReminder, another product from Voicent Communications, Inc. The product contains an easy to use calendar, similar to Outlook. If you do not have Outlook, you should just use that program. Free version available also. Ideal for mobile professionals. Never miss an appointment again.